Sattu — roasted gram flour — is not just food in Bihar. It is an entire way of life. Interestingly, its place in popular culture notwithstanding, sattu is not used in any religious ceremony. Although the origins of this debarment are unclear, it is believed that this could be due to the fact that members of ‘lower’ castes used to be the ones doing the actual roasting. Such perceptions aside, sattu has pride of place in the culinary diversity of southern Bihar. 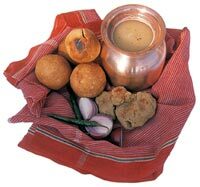 In fact, sattu is so popular in the area that people from the northern parts of Bihar jocularly refer to southern Biharis as ‘sattukhor’, meaning one who feeds on sattu. Traditionally considered the ‘food of the poor’, sattu is the ideal combination of nutrition and cost-effectiveness. Very rich in protein, it has the peculiar ability of leaving one satiated a long time after one has eaten it. Even doctors advise longer hours of physical work after sattu’s been eaten. Did they learn that from farmers, who do exactly that? This is probably why sattu has a certain political connotation. The elderly in Bihar say that sattu has been a buffer between people dying of malnutrition and the apathy of the state’s political class. Sattu is the lifeline of rural Bihar in two ways: The protein-rich, highly affordable sattu diet keeps malnutrition at bay; two, it needs no cooking, and thus saves them precious fuelwood. Sattu is an adaptable food eaten in many forms. And this explains its acceptability across social classes. Workers eat it unprocessed in any manner. It is also kneaded into dough and eaten with onions and green chillies. It doubles up as a refreshing summer drink for Bihar’s poor. A couple of glasses a day not only make high temperatures bearable, but also keeps the stomach in good order. This apart, sattu is ideal for persons suffering from peptic ulcer, a common ailment in India. With popular recipes like litti, Bihar’s best-known delicacy, and sattu ka paratha, the poor person’s sattu is finding itself part of fashionable dinner spreads and fireside gatherings. And with its characteristic taste, sattu also brings with it the ability to fight diabetes, one of the most widespread lifestyle diseases of this century. A conference of physicians held in April 2002, in Delhi, concluded that sattu is ideal for diabetic patients as it holds its own on what is called the glycemic index. The glycemic index ranks foods on how they affect our blood sugar levels. This index measures how much your blood sugar increases in the two or three hours after eating. If food containing less carbohydrates and high protein and fat are considered good for diabetic patients, sattu seems to possess the right combination. Litti: Mix one tablespoon (tbsp) onion seeds (mangrail), one teaspoon (tsp) each of cumin powder, coriander powder and carom seeds (ajwain), two tsp of mango powder (amchur), 5-6 chopped garlic cloves, some ginger and a couple of roasted whole red chillies. Into this preparation, further mix in two tbsp mustard oil and half a kilogram (kg) of sattu. Knead a kg of wheat flour and salt to form dough that is somewhat elastic and pliable. Make balls out of the dough. Fill in these doughballs with the sattu mixture. Roast until the doughballs are crisp and deep brown. You can eat Litti with potatoes and baingan (brinjal) ka bharta, savoury pickles and a generous dab of ghee. Sattu ka paratha: Stuff the dough with a mixture of sattu, onion, ginger, garlic and chillies. Roll like chapattis. Make parathas on the tawa. Sattu ke laddoo: Mix sattu with milk and sugar and prepare dough. Roll into laddoos and serve instantly. Sattu: Roasted gram is powdered and kneaded into a dough along with salt and water. Eat with onion and green chillies. Sattu drinks: Once known as c2 syrup (an anglicised mock-term). Mix two tbsp sattu in a glass of water. Add salt, cumin powder and lemon juice. Alternatively, you could add sugar. Either ways, its a completely refreshing energy drink.